RADIO RAINBOW INTERNATIONAL: Radio Rainbow International was logged for the first time on Sunday 21st July 1985. The station was operated from the Drogheda area by Boyneside Radio deejay and engineer, Heady Eddie. Originally, transmissions were only on shortwave with about 400watts, but these eventually expanded to take in 1521kHz medium wave, and FM on various frequencies around 96.5MHz. The 1521kHz transmissions were between 500 and 1000 watts in power and could be heard down the East coast of Ireland, Wales, North West England and South Western Scotland. Radio Rainbow usually operated from around 1100 until 1300 hours on a Sunday morning. 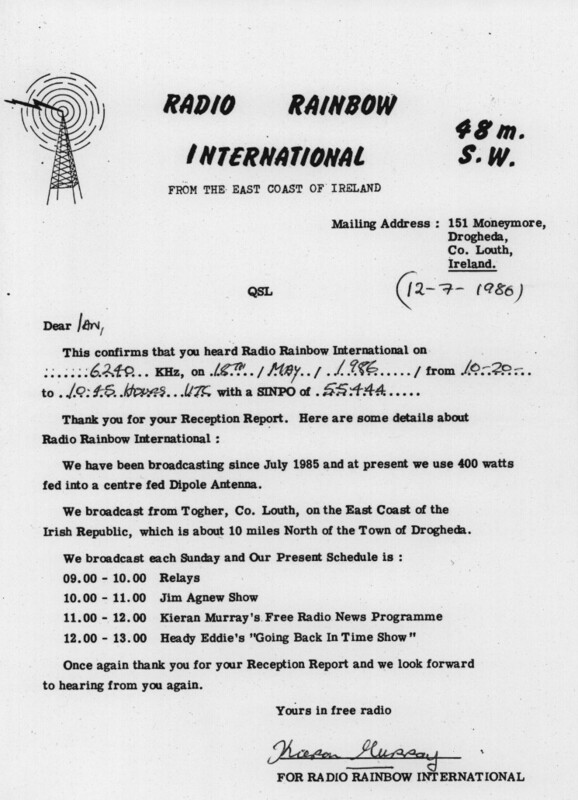 Early programmes were from Heddy Eddie, Ian Scott and also included a weekly free radio show hosted by Kieran Murray, who also worked on Boyneside Radio at the time. The free radio shows continued until around May 1988. In early 1987 Radio Rainbow began offering airtime on the station to beleagured free radio operators in the UK and Europe who were suffering raids from the authorities. Heady Eddie was heard on a promo for this on 12th April 1987. Regularly relayed stations included The Voice of Guernsey and Scottish stations WLR and Cruising Solid Gold. Possibly as a result of the success of these relays, the station's transmitter on 1521kHz also relayed former London station Radio Sovereign when it attempted a comeback to Northwest England in August 1987. This only lasted a few weeks however, apparently due to non receipt of payment for the lengthy transmission times. Radio Rainbow's own programmes ceased during mid 1988, but relays continued until December 1988. The shortwave frequency was changed to 6231kHz and the transmitter made its final broadcast on 30th December 1988, when it was one of numerous transmitters relaying the Boyneside Radio closedown just before the introduction of the 1988 broadcasting act. Below is a QSL sheet received from the station in late 1986.